Here he is kneeling before lady Delacour, Belinda’s hostess. Leap in with me into this weedy flood. “Damn it, yes, where is Clary though?” exclaimed sir Philip, suddenly recollecting himself. Clarence Hervey at this instant was drowning, he had got out of his depth, and had struggled in vain to recover himself. Clarence comes back to life, sans friends but with Sir Percival looking on. 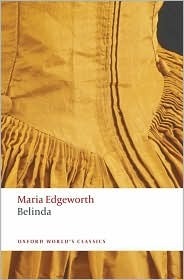 I approve of this Maria Edgeworth. Indeed I do.